I’m still planning on a blog post about level crossing removals / elevated rail — after digesting all the information released today on the Dandenong line crossings. This is just a quickie to address a specific related topic: Value capture above railway lines, specifically when tracks are dropped below road level, the idea that you can develop above them, and that can pay for the level crossing removal. I like the idea. It’s great in theory. There have been lots of proposals to do it, perhaps the most ambitious being “Operation Double Fault“, a plan from ten years ago to deck over the entire inner portion of the Glen Waverley line. Media House — Source: Wikipedia. I stretched this photo vertically. The original looked too squished to me. None of these three included the cost of moving the railway. This was already done (though consolidating rail lines and platforms underneath was done in conjunction with building Federation Square). The other thing they have in common is that they were all done in inner-city or city centre areas where the cost of land is huge, which may have made them more economically viable. 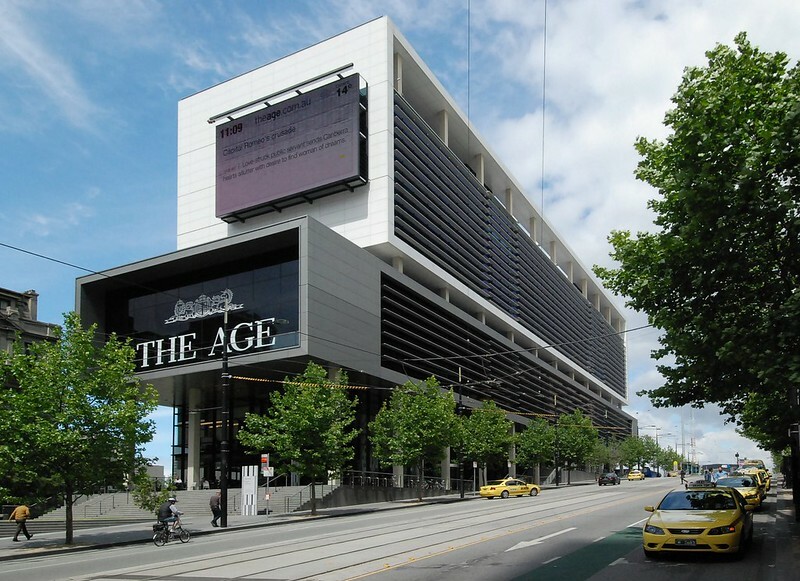 Construction of the decks for Media House and Federation Square caused impacts to train services. I don’t recall if Chapel Street was the same. Shops in Nicholson Street, Footscray were built in a similar manner, but that was in the 1920s. Off the top of my head I can’t think of any other recent examples. Maybe someone can point to some. So while it’s a great idea, to me it doesn’t seem that the economics stack up, at all, otherwise we’d see far more of it. Which makes me wonder whether the properties over the curve in the Clifton Hill group tracks between Jolimont and West Richmond stations. Is there a payback with increasing land value – inner ring/next ring suburbs mainly? Could the duplication of the single track section Heidelberg to Rosanna crest valuable realestate? It’s already (partly) below grade. Must be other examples of cuttings and opportunistic infill (well, overfill). Their only other ‘value capture’ projects are government signing over empty land to the rail operator for development. @Marcus, thanks for posting that link. I remembered you’d written it, but couldn’t find it earlier! Does Box Hill Central count? Box Hill was rebuilt 1983-85, so I’m not sure it counts as recent. They do this alot in Japan and it works very well especially with shops and such on top of the stations. It keeps the area well activated and busy. Atop railways should be cycleways. Not commercial buildings. Once a commercial building has been built atop a railway, how will you put in a cycleway? Obviously there should be a cycleway between Southern Cross Station and North Melbourne given the travel demand between those 2 stations and the fact that RRL trains no longer stop at North Melbourne. And no, people cannot board an overcrowded train at North MEL to get to Southern Cross. Value capture also works the other way. With Fed Square, the railways parlayed their stabling yard into new maintenance depots and a complete renewal of the life expired infrastructure between Flinders St and Jolimont Junction. So the railways were on-board with Fed Square. And, yes, the price of Fed Square was substantial and very much in excess of what was originally budgeted. The economics of building over railway lines can be inferred from the trajectory of ‘Operation Double Fault’. It came back several times, and each time the costs and risk bourne by the State increased. And the size of the proposed developments above the line increased. The attempted shifting of costs onto the state and the public was a very clear indication of what the actual economics were. Finally, in this context, I’ve always found it very interesting that there are *never* any proposals to build over freeways or major arterial roads, only railways. And yet, the land area available over roads far exceeds that of rail. And the construction costs would be far less – due to the ability of road traffic to weave and climb during stageworks in construction. @ChrisP. No capture in the properties over the curve between Jolimont and West Richmond. Roughly three quarters of the land over the tunnels is road (Wellington St and Hoddle St). There are only three groups of buildings actually over the tunnels, all east of Hoddle St. The two major buildings pre-date the railway. The three terraces at 155-9 are of the ‘High Victorian’ style and would have been built around or just before 1890, while 167 Hoddle is a slightly older Victoria style and would probably date from the early to mid 1880s. The railway was opened in October 1901. The bit in between is interesting. Largely vacant land with a small building, it suggests that the costs of building over the tunnels outweighs the value of any land/building that can be constructed. So even where the railway is already lowered and encased in a tunnel in an inner city location, the economics don’t stack up. I am sure that there are many more potential value capture projects that could be built over existing railways for a reasonable return. They could even help boost parts of some of the shopping strips that are on the less busy side of the railway. Toorak Rd South Yarra opposite South Yarra station. Because of the old post office on the corner of Osborne St means that the Sandringham line cannot be built over but the line to Caulfield still could be, although there may need to be a parking exemption. Chapel St Windsor, opposite the station. Glen Huntly Rd Elsternwick, opposite Elsternwick station. High St Armadale, both sides of the track. Glenferrie Rd Malvern, both sides of the track. Burke Rd Camberwell, opposite the station, if there is still enough clearance with the track rising from the cutting. The shops on the eastern side of Chapel St date from the mid-1990s, so are older than other building over the railway projects. @Tom, my point is: if it’s so good economically, why isn’t it happening more? Yes, I agree with the point about freeways. Even the Princess Highway between Caulfield and Oakleigh. Keep the service lanes above ground, but you could easily bury the main carriageways. Lastly, I do not like the preference to having things built underground. What happens if a fire or bomb goes off. Lets not forget 2005 in London. I am not saying dont ever. I am saying do not prefer it. A freight train that slams into the side of a tunnel wall, versus falling over the side of a sky rail bridge. I much prefer the rescue options for the skyrail derailment. Getting cranes in to lift while you remove bodies and clean up the crash site…. It would be great to build open huge expanse of road but I can understand the difficulty of doing one: getting rid of exhausts associated with fossil fuel burning vehicles. Much easier to deal with electricity powered trains. There’s still the deal with diesel fumes, but cars and trucks outnumber diesel trains by a large proportion. Sorry in my last comment I mean building over large expanse of road.